The traditional game piece of seventeenth-century Dutch and Flemish painting is a highly colored, elaborately detailed, and often gory trophy of the hunt, where mounds of slaughter, slippery with blood and viscera, spill from laden tabletops. Jean-Baptiste-Siméon Chardin had no interest in the hunt itself but adapted the genre to his own quiet contemplation of natural phenomena. Bringing to bear close visual scrutiny and a brilliant ability to evoke tactile sensations, he created some of the greatest still-life paintings of the eighteenth century. In a series of game pieces painted around 1730 he depicted dead hares placed among a few simple hunting implements, such as the horn powder flask and hunting bag seen here, studio props that also appear in other paintings. 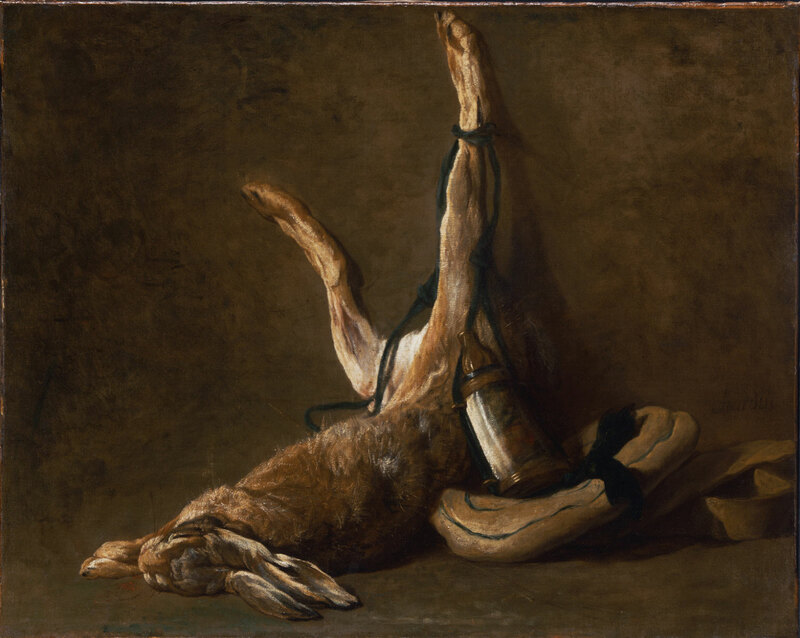 Chardin explored the properties of materials and textures as well as the play of light on objects. Marked by audacious simplicity and directness, this composition is almost monochromatic, the artist's subtle visual discriminations richly evoking tactile experiences and demanding of the viewer equal precision in the act of looking. Christopher Riopelle, from Philadelphia Museum of Art: Handbook of the Collections (1995), p. 180.